June 2013 saw the launch of a comprehensive scientific study on the subject of shoeing, funded by the Werkman Horseshoes company and led by Dr. Jenny Hagen (Veterinary-Anatomical Institute (Veterinär-Anatomisches Institut) of Leipzig University). The study focused on the impact of various horseshoes and shoeing modifications, taking into account diverse soil types, on • the distribution pattern of the vertical compressive forces exerted on the hoof • the size of the load-bearing area • the foot roll and the gait • the orientation of the phalanges The results of this study were used for the development of the Werkman Ortho-Kit. 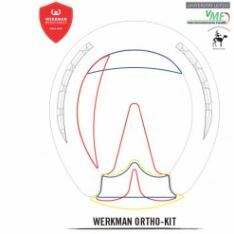 The Werkman Ortho-Kit provides you with an effective and straightforward means to turn Werkman horseshoes into various therapeutic shoes.